66 MARINE NORTH Crosslake • 218-692-6161 BAY LAKE MARINE Deerwood • 218-534-3435 BEMIDJI MARINE Bemidji • 218-444-2628 BOOMERANG MARINE Melrose • 320-256-4642 Alexandria • 320-759-3163 BRAINERD SPORTS & MARINE Brainerd • 218-828-4728 DALE’S MARINE Madison Lakes • 507-243-4106 DAN’S SOUTHSIDE MARINE Bloomington • 952-881-0077 FARM ISLAND REPAIR & MARINE Aitkin • 218-927-6395 FRAHM MARINE WERX Stewartville • 507-533-4230 GRAND RAPIDS MARINE Grand Rapids • 218-326-0351 HALLBERG MARINE Wyoming • 651-462-4516 HANNAY’S MARINE St. Anthony • 612-781-7411 HIGHWAY 3 MARINE Brainerd • 218-829-7063 J&J MARINE South Haven • 320-236-3625 J&K MARINE Detroit Lakes • 218-847-0324 ERICKSON MARINE Hastings • 651-437-6159 J&K MARINE Walker • 218-547-2800 KOVASH MARINE Moorhead • 218-233-3300 LA CANNE’S MARINE Faribault • 507-334-6415 LAKE OF THE WOODS MARINE Baudette • 218-634-2289 LITTLE CROW SPORT CENTER Spicer • 888-690-2628 MUSKY HOUSE MARINE Longville • 218-363-2044 NELSON MARINE White Bear Lake • 651-429-4388 PARKSIDE MARINA Wabasha • 651-565-3809 POWER LODGE Ramsey • 763-576-1706 RECREATIONAL REPAIR Farmington • 651-460-2930 RIVERVIEW SPORTS Elk River • 763-441-1799 SMITTY’S MARINE Lake City • 651-345-3990 SNELL POWERSPORT Mankato • 507-304-6755 SOUTHSIDE MARINE Waseca • 507-835-3032 SPR MOTORSPORTS Pequot Lakes • 218-568-4853 TIMBUKTU MARINE Cook • 218-666-2276 WESTRE’S MARINE & SPORT St. Cloud • 320-230-0000 Gimme Six Extended Protection promo is applicable to new Suzuki Outboard Motors from 25 to 350 HP in inventory which are sold and delivered to buyer between 04/01/19 and 06/30/19 in accordance with the promotion by a Participating Authorized Suzuki Marine dealer in the continental US and Alaska to a purchasing customer who resides in the continental US or Alaska. Customer should expect to receive an acknowledgement letter and full copy of contract including terms, conditions and wallet card from Suzuki Extended Protection within 90 days of purchase. If an acknowledgement letter is not received in time period stated, contact Suzuki Motor of America, Inc. – Marine Marketing via email: marinepromo@suz.com. The Gimme Six Promotion is available for pleasure use only, and is not redeemable for cash. Instant Savings apply to qualifying purchases of select Suzuki Outboard Motors made between 04/01/19 and 06/30/19. For list of designated models, see participating Dealer or visit www.suzukimarine.com. Instant Savings must be applied against the agreed-upon selling price of the outboard motor and reflected in the bill of sale. (Suzuki will, in turn, credit Dealer’s parts account.) There are no model substitutions, benefit substitutions, rain checks, or extensions. Suzuki reserves the right to change or cancel these promotions at any time without notice or obligation. * Financing offers available through Synchrony Retail Finance. 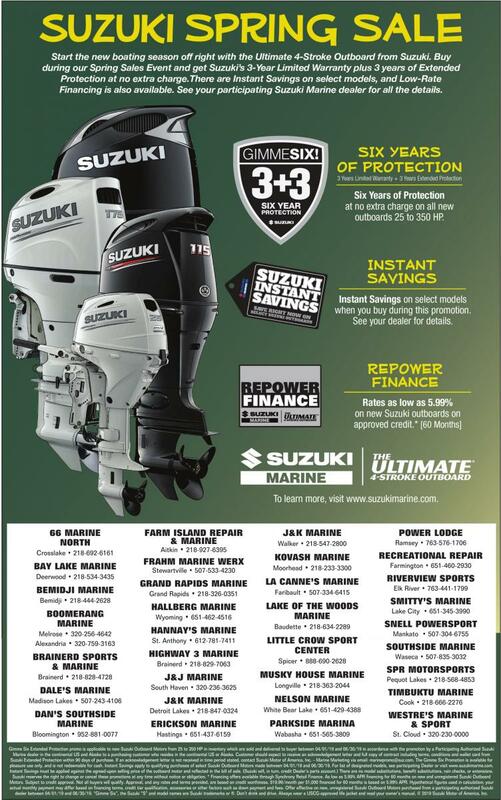 As low as 5.99% APR financing for 60 months on new and unregistered Suzuki Outboard Motors. Subject to credit approval. Not all buyers will qualify. Approval, and any rates and terms provided, are based on credit worthiness. $19.99/month per $1,000 financed for 60 months is based on 5.99% APR. Hypothetical figures used in calculation; your actual monthly payment may differ based on financing terms, credit tier qualification, accessories or other factors such as down payment and fees. Offer effective on new, unregistered Suzuki Outboard Motors purchased from a participating authorized Suzuki dealer between 04/01/19 and 06/30/19. “Gimme Six”, the Suzuki “S” and model names are Suzuki trademarks or ®. Don’t drink and drive. Always wear a USCG-approved life jacket and read your owner’s manual. © 2019 Suzuki Motor of America, Inc.
Gimme Six Extended Protection promo is applicable to new Suzuki Outboard Motors from 25 to 350 HP in inventory which are sold and delivered to buyer between 04/01/19 and 06/30/19 in accordance with the promotion by a Participating Authorized Suzuki Marine dealer in the continental US and Alaska to a purchasing customer who resides in the continental US or Alaska. Customer should expect to receive an acknowledgement letter and full copy of contract including terms, conditions and wallet card from Suzuki Extended Protection within 90 days of purchase. If an acknowledgement letter is not received in time period stated, contact Suzuki Motor of America, Inc. – Marine Marketing via email: marinepromo@suz.com. The Gimme Six Promotion is available for pleasure use only, and is not redeemable for cash. Instant Savings apply to qualifying purchases of select Suzuki Outboard Motors made between 04/01/19 and 06/30/19. For list of designated models, see participating Dealer or visit www.suzukimarine.com. Instant Savings must be applied against the agreed-upon selling price of the outboard motor and reflected in the bill of sale. (Suzuki will, in turn, credit Dealer’s parts account.) There are no model substitutions, benefit substitutions, rain checks, or extensions. Suzuki reserves the right to change or cancel these promotions at any time without notice or obligation. * Financing offers available through Synchrony Retail Finance. As low as 5.99% APR financing for 60 months on new and unregistered Suzuki Outboard Motors. Subject to credit approval. Not all buyers will qualify. Approval, and any rates and terms provided, are based on credit worthiness. $19.99/month per $1,000 financed for 60 months is based on 5.99% APR. Hypothetical figures used in calculation; your actual monthly payment may differ based on financing terms, credit tier qualification, accessories or other factors such as down payment and fees. Offer effective on new, unregistered Suzuki Outboard Motors purchased from a participating authorized Suzuki dealer between 04/01/19 and 06/30/19. “Gimme Six”, the Suzuki “S” and model names are Suzuki trademarks or ®. Don’t drink and drive. Always wear a USCG-approved life jacket and read your owner’s manual. © 2019 Suzuki Motor of America, Inc.